More than ten million people visit Andorra every year to enjoy holiday activities such as skiing, shopping and nature hikes. However, history lovers will also be in their element in this small nation between France and Spain in the Pyrenees, as there is a range of attractions dating back hundreds of years that are well worth checking out. 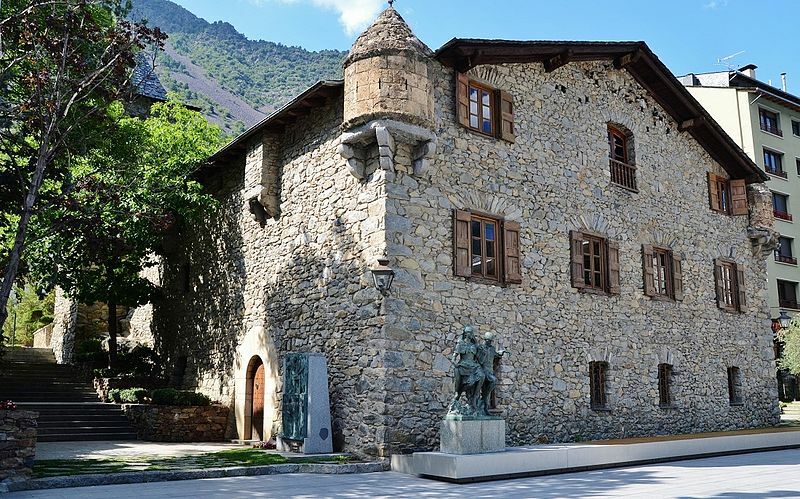 Among the most interesting is the Casa de la Vall, which is situated at the the centre of Andorra la Vella and is an historic house steeped in the past and politics of the principality. The house was built in 1580 by the Busquets family as a manor house and tower, with defensive features that are still visible on its exterior today. Its importance, grandeur and ideal location made it perfect for official meetings and in 1702, it became the seat of one of the oldest and most continuous parliaments in Europe – the Consell General, which can trace its history all the way back to 1419. The ground floor became a courtroom and is spectacularly decked out in wooden panelling that lends a real air of reverence for this function, something that continued there well into the 21st century. In the 1950s, refurbishments were begun and the project was expanded in 1962 so that the building could become a fully parliamentary space. Among the work carried out was the extension of the eaves, renewal of the staircase and the creation of a proper assembly room in the attic. This restoration proved worthwhile, but as the 20th century drew to a close, it became evident that the parliament would need a bigger space in which to practise. In 2011, work started to create a new building in the grounds of the old one for this purpose – but the developers made sure the inhabitants still have a clear view of the original Casa de la Vall for posterity’s sake. Visitors to Andorra can book guided tours around this fascinating house in several languages, as it is fully open to the public. It is advisable to do this around a week in advance in the summer, as the attraction can get quite busy during peak periods. On your way in, don’t forget to cast your eyes upwards to see the Busquets family coat of arms and the motto of Andorra, Virtus, Unita, Fortior, which translates as ‘virtue united is stronger’. It’s also worth taking a walk into the gardens, where you’ll find a sculpture called La Danse designed by Francesc Viladomat.Inside, don’t miss the closet of the seven keys, which has housed a range of important documents over the centuries and has a lock for each of the parishes of Andorra. It could only be opened if a key-bearing representative from each of the seven parishes was present, thereby ensuring maximum security. The Casa de la Vall is easy to find from hotels in Andorra – it lies next to the Andorra National Library.